Christmas, Hanukkah, Kwanzaa, Solstice, Festivus. However you choose to celebrate, one thing is clear: ‘Tis the season to be jolly. And it is the season to be generous — with your time, your means, your love and your spirit of fun. There are less than six weeks between now and Jan. 1, 2012, so make this next month count. Here are 25 things for everyone to do, from your most little sugar plum fairies and Santa Babies to even the most Grinchy of Grinches. Happy holidays from all of us at the Bangor Daily News! The second year for this gathering of Maine artists, artisans and craftspeople is one of the best ways to get a truly unique gift for someone you love. The Clifford Gallery at Waterfall Arts is transformed into a modern marketplace, complete with displays and racks of everything from accessories to printed goods, clothing to hanging works of art and more. For information, visit waterfallarts.org. All Ralphie ever wanted was a Red Ryder BB Gun. You know the film — but the stage adaptation is just as hilarious and heartwarming. PTC’s cast of talented young actors head up a production that’s a welcome new addition to the theater’s holiday programming. Tickets start at $15 for children. For information, visit penobscottheatre.org. Norlands takes you into life on a farm in 18th and 19th century Maine, so with its annual open house 11 a.m.-4 p.m. Dec. 3, you really can enjoy an old-fashioned holiday. Caroling, mulled cider, activities in the old one-room schoolhouse and farmer’s cottage, an antique toy exhibit and ornament making are scheduled for the event. Admission for adults is $8, children under 12 is $4, under 6 free. For information, visit Norlands on Facebook. The elegantly appointed Woodlawn Mansion in Ellsworth is transformed by local designers and artists into a holiday wonderland, starting 5-7 p.m. Nov. 30, with its Victorian Christmas Open House. For $15, $12 for members, you get hors d’oeuvres and holiday cheer. Holiday tours of the mansion are offered 10 a.m.-4 p.m. Dec. 1, 8, 15 and 22. There’s also Woodlawn’s beloved holiday high teas, 3-5 p.m. Dec. 7, 11, 14 and 21. The tea costs $20, $18 for members, and is a delightful holiday experience for the whole family. To reserve a tour or a tea, call 667-8671. It’s more important than ever to support local businesses, and many towns in Maine go to great lengths to make it easy for the average shopper to do so. Downtown Bangor kicks off the season 4 p.m. Dec. 3, with the Festival of Lights parade, and many downtown businesses offer extended hours and special deals. Midnight Madness in Bar Harbor runs from 8 p.m. to midnight Dec. 3, with more than 30 shops participating. And, as always, there’s lot to see in Portland’s Old Port and on Congress Street. Enjoy an evening with beloved musician and composer Paul Sullivan as The Grand Auditorium kicks off the holiday season in downtown Ellsworth. Paul will be joined by John Bapst High School soprano protege Rosie Upton, performing new songs for the holidays. The show starts at 7:30 p.m. Friday, Dec. 2, at The Grand, and is perfect for families. Admission is $22 for adults, $17 for students and $12 for kids. A rare opportunity to see some of the stunning homes of Eastport is on the schedule the first weekend of December, with a self-guided tour open to the public 1-6 p.m. Dec. 3 and 4. The Eastport Chamber of Commerce and the Eastport Garden Club have helped homeowners decorate for the season, so the residences — most of which date from at least the turn of the century, if not earlier — will be even more splendid than usual. Tickets for the tour are $15, available by calling 853-0800. Santa again will make a spectacular appearance at the Owls Head Transportation Museum, arriving at 12:30 p.m. Sunday, Dec. 4, in his own airplane, ready to read a story to well-behaved boys and girls — and to take letters back to the North Pole for his perusal. Santa’s appearance will be preceded by a holiday ornament-making workshop at 11:30 a.m. followed by a holiday concert by the Midcoast Community Band from 1:30 to 3 p.m. Admission is free for all. 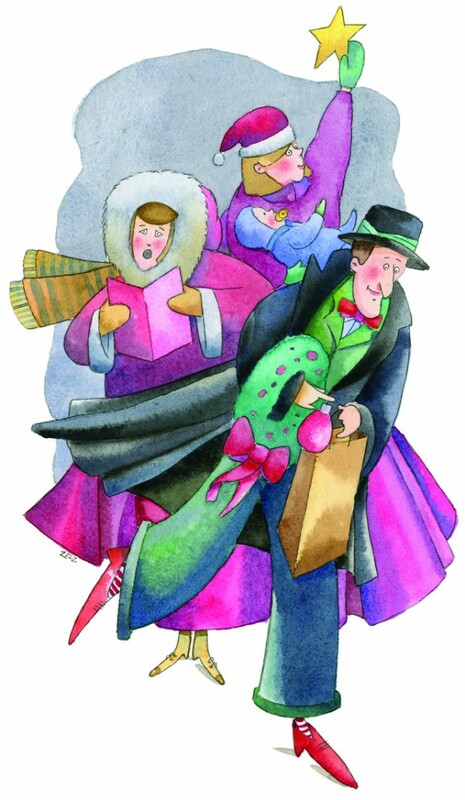 There are a number of performances of “A Christmas Carol” all over Maine. Everyman Repertory Theatre and John E. Bielenberg will present Bielenberg’s personal take on Scrooge at 7 p.m. Dec. 9-10, and 16-17, and 2 p.m. Dec. 18, at the Camden Opera House. The Slightly Off Center Players of Dover-Foxcroft will present their version at 7 p.m. Dec. 2-3, and Dec. 8-9, as well as 2 p.m. Dec. 4 and 10, at the Center Theatre in Dover-Foxcroft. And the New Surry Theatre will take its one man “Christmas Carol” on the road, with performances at 7 p.m. Dec. 9, at Hammond Hall in Winter Harbor, at 7 p.m. Dec. 10, at the Stonington Opera House, 7 p.m. Dec. 16, and 3 p.m. Dec. 18, at the Blue Hill Town Hall, and at 7 p.m. Dec. 23, at the Neighborhood House in Northeast Harbor. The zany antics of the New Vaudeville Revue once again grace the stage in downtown Belfast, as a cast of actors, comedians, musicians and poets offer up a full evening of fun. It’s hosted by Ando Anderson, it’s backed up by the New Vaudeville Revue House Band and it features performers Peter Conant, Kristen Burkholder, Jenny Tibbetts, Jennifer DeJoy and Erik Perkins. The poet of the month is Arielle Greenberg Bywater and the musical guest is Portland songwriter Emilia Dahlin. Tickets are $12, on sale at Aarhus Gallery in downtown Belfast, and also at the door. Give your children a holiday experience they’ll never forget, with the annual Polar Express train ride, courtesy of the Maine Narrow Gauge Railroad, a 90-minute journey from Portland to the “North Pole” where kids will meet Santa, enjoy treats, songs and stories and receive a special holiday bell all in a truly festive atmosphere. Train rides are at 2:45 p.m., 4 p.m., 5:15 p.m. and 6:30 p.m., Nov. 25-27, Dec. 2-4, Dec. 9-11, Dec. 16-18 and Dec. 21-23. Tickets are $25 for coach seating and $40 for first class. Tickets are available online at porttix.com. The “Dancing With the Stars” season may have ended last week, but you can still get your ballroom dance fix with the Rockland-based dance school Swing n’ Sway’s twice-annual dance showcase, set for 2 p.m. Sunday, Dec. 4, at Strom Auditorium in Rockport. This holiday-themed performance will feature classic ballroom and Latin dances, such as waltzes and cha chas, hip-hop and more. They will be performed by amateurs and nationally acclaimed professionals of all ages, including performances by Kinetic Energy Alive, Rockport Dance Conservatory and Nathifa Shakti Belly Dance. Tickets can be purchased at the door. Lots of theaters around the state are showing heartwarming holiday favorites along with family classics. The Grand will show “It’s a Wonderful Life” at 1 p.m. Dec. 20-23, as well as a school vacation matinee of “Rango” at 1 p.m. Dec. 26-30; all screenings are $1. The Strand Theatre in Rockland will show “White Christmas” at 3 p.m. Dec. 17, for $5, and a free screening of “National Lampoon’s Christmas Vacation” at 3 p.m. Dec. 23. For three weeks each year, birders of all levels do their part to figure out the state of North American birds. The Christmas Bird Count has taken place every December for more than 100 years, and thanks to the data recorded by participants, scientists have a better understanding of just what’s out there. You can find the bird count closest to you by visiting the Maine Audubon website; upcoming counts include Mt. Desert Island, Orono-Old Town and Rockland on Dec. 18, Blue Hill on Dec. 19, Eastport on Dec. 26, and Bangor, Bucksport and Presque Isle on Jan. 1. Join bluegrass maven Darol Anger and Republic of Strings for an evening of Yulegrass music, good cheer and wassail at One Longfellow Square in downtown Portland. Also performing that night will be Portland players Lauren Rioux on five-string violin and Joe Walsh on mandolin, bassist Karl Doty and West Coast guitar star Scott Law. It’s a memorable musical journey into the heart of the season. Traditional refreshments, decorations and good fellowship will abound in Portland’s premiere listening club. For tickets, visit onelongfellowsquare.com. Take the whole family to Bay Chamber Concert’s annual free holiday performance at the Rockport Opera House, 2:30 p.m. Sunday, Dec. 11. The concert will feature all four Odeon ensembles, including junior, symphony, chamber and adult. A program of music both holiday-related and not is set, as well as a string concerto featuring cellist Marc Johnson. For information, visit b aychamberconcerts.org. A time-honored tradition in eastern Maine is Robinson Ballet’s annual production of “The Nutcracker,” which each year grows bigger and includes more venues. This year’s performances are set for 2 p.m. Sunday, Nov. 27, at Houlton Community Arts Center, 12 p.m. and 4 p.m. Dec. 10, and 2 p.m. Dec. 11, at the Grand Auditorium in Ellsworth, and 2 and 7 p.m. Dec. 17, and 3 p.m. Dec. 18, at the Collins Center for the Arts in Orono, with the Bangor Symphony Orchestra performing Tchaikovsky’s timeless music. For ticket information, visit robinsonballet.org. This is the musical baby of Stone Mountain proprietor Carol Noonan, who hosts this variety style show with house band the Stone Mountain Boys. Comedian Mike Miclon will warm up the crowd before the show, and the band backs up special guests each show. In the past, they’ve included luminaries such as Kathy Mattea, Chris Smither, Paula Cole, Mary Chapin Carpenter, Suzy Bogguss and the Wailin Jennys. Optionally, the night can include a special family-style dinner prepared by guest chef Jonathan Spak, owner-chef of the Oxford House Inn, along with a beer and wine tasting to start the festivities. To reserve tickets, visit stonemountainartscenter.com. Don’t have a big family holiday to attend, but do have a special someone who you’d like to treat? There are several fabulous holiday dinners planned at fine restaurants around the state. Portland’s Cinque Terre offers up a traditional Feast of the Seven Fishes, a multicourse Italian meal with wine pairings, from 4:30 to 8 p.m. Saturday, Dec. 24; the cost is $50 for the meal, extra for wine. Natalie’s in Camden has a luxurious Christmas day five-course meal, with several seatings throughout the afternoon and evening; the meal is $79, plus wine. And the James Beard Award-winning Arrows Restaurant in Ogunquit offers a “Maine Classics” holiday meal, featuring the chef’s favorite selections, on Thursday and Friday, Dec. 22 and 23. Contact the restaurants for information. For those celebrating Hanukkah this year, Jewish rapper and musician Matisyahu brings his celebratory Festival of Lights tour to the State Theatre in Portland this year during the eight-day holiday. Expect lots of high-energy spiritual music and a disco-ball menorah, among many other things. Doors are at 6:30 p.m. and tickets are $25 in advance, $28 at the door. The Metropolitan Opera’s high-definition broadcasts are the next best thing to seeing it in person, and as a holiday gift, it’s offering reduced price rebroadcasts of two family-friendly operas. Mozart’s “The Magic Flute,” in an imaginative staging by Julie Taymor, will be shown at 6:30 p.m. Wednesday, Dec. 21, at the Strand Theatre in Rockland, and at 6 p.m. Tuesday, Dec. 27 at The Grand in Ellsworth. The Grand will also show Humperdinck’s “Hansel and Gretel” at 6:30 p.m. Thursday, Dec. 29. Admission is $10 for youth — a bargain for parents hoping to educate their children. Bangor’s Downtown Countdown last year attracted more than 3,000 people, and this year’s event is only going to be bigger. Music, dance, poetry, movies, comedy, storytelling, kid’s activities and plenty more are set for more than 10 venues throughout downtown Bangor. It’s Maine’s best New Year’s Eve celebration. For information and a full schedule, visit downtownbangor.com. Be the first in the country to ring in the New Year, and do it in truly unique Downeast style with Eastport’s annual Sardine Drop, in which the Tides Institute lowers a specially constructed sardine to signify midnight. One hour earlier, at midnight Atlantic time, a maple leaf is also dropped. Eastport businesses and restaurants stay open late to welcome revelers with music, dancing, theater and more. The entire family can enjoy the last night of the year, with Belfast’s 14th annual citywide New Year’s party. Tons of music, comedy, poetry, children’s activities and more are set in more than ten venues, ending with a parade, bonfire and riotous good time. For a schedule and where to buy a pass, visit nybb.org.